The Garden of Eden was a place where first man walked and talked with God. However, due to sin, man was thrown out of Eden and given a life sentence. The Word of God became flesh, dwelled among us, and died for the sins of the world. While the seed of first man dies, the seed of Christ will inherit the earth! To begin with, “The Word of God” is Jesus Christ. However, to understand who Yeshua (Jesus) is, one must hear him in his own words from John 8 KJV. Unequivocally, “the word of God is quick, and powerful, and sharper than any two-edged sword, piercing even to the dividing asunder of soul and spirit, and of the joints and marrow, and is a discerner of the thoughts and intents of the heart.” (Heb. 4:12). In this blogger’s hand, the biopolymer hyaluronic acid (HA) forms divine patterning during dehydration on glass slides. In addition, HA can take on the various helical shapes, including a double helix like DNA as well as that of the cross structure, laminin. It appears that faith may unlock “gospel messages” kept secret from the world for thousands of years. There is a Messianic skit in blood featuring three biopolymers. Of the three: laminin, hyaluronic acid (HA), and mitochondrial DNA, my research relates to hyaluronic acid (HA), the biologic veil. 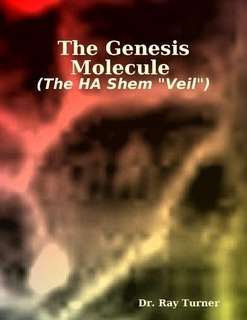 DNA’s relationship to HA is analogous to the relationship between the Lamb of God and the Hebrew temple veil. One can imagine how macromolecules synchronize to complete a biological event. These sequences resemble a “skit.” Hyaluronic acid (HA) hydro-images express hidden divine messages as “embroidery.” These “embroideries” are verifiable using the King James Version of the Holy Bible. Interestingly, there are 22 amino acids and 22 characters in the Hebrew alphabet. Interestingly, each amino acid corresponds to a triplet code. However, there are 64 triplet codes for DNA synthesis not counting the start and stop sequences. Similarly, there are 64 books in the bible not counting Genesis (start) and Revelation (stop). Without a doubt, Christ comes in the volume of the Book. So, DNA is the Living Word of God (1), and there are 3 in 1. As a result, these three bear witness. Hence, there is no coincidence that the LAMB gene produces Laminin, a “three in one” protein active in the gathering of rogue GAGs in and around the cell. Amazingly, this sequestering by laminin is analogous to the hanging of man’s sins on”the Lamb” of God. DNA binds to laminin (the cross) and the cell adhesion molecules that anchor it to cell surfaces. (2) Also, the cross (laminin)–washed in the blood–uncouples HA, the biologic veil. This biological scenario is analogous to the tearing of the temple veil at the moment Christ (Yeshua) died on the cross. The laminin crosses bind other extracellular matrix molecules in blood (cleansing power) and take them to the HA veil. The temple veil ripped in two by God (HaShem). The Lamb of God dies on the cross, and the Father accepts his Blood as a ransom (cleansing power) for the sins of the world. This gift allows those of us in the “body of Christ” to enter the Most Holy Place. The Gospel of Jesus Christ is a message for the ages. As such, true believers exist throughout time. However, these messages are hidden in patterns, types, shadows, and prophetic visions. For instance, messages revealing Christ appear as gospel hydro-images. Also, the Bible describes the temple veil so that only modern research tools can fully translate its pattern. Why? To prove that we are a pattern of the “Living Temple of God.” Be that as it may, the Holy Spirit dwells within the “elect” of God. Who find these hidden messages? Those having faith in the unseen things of God and an eye for scientific discovery will find these messages. Without a doubt, only an omnipotent, omnipresent, and omniscient Creator could have left these messages. Finally, figure 2 illustrates the blindness of unbelievers who argue that only science can discern truth. On the contrary, such blindness will lead to a catastrophic loss of souls unable to find an incorruptible body to enter heaven. For Believers, our body is the incorruptible body purchased for us through the Blood of Yeshua (Jesus). We know from bible scriptures, “all things consist in Christ“. In addition, the front page of this blog points out that Christ is the “One” in the Euler Identity and the “One” in Ezekiel’s wheel. However, God has no beginning and no end except for his manifestation as Jesus Christ. And, he is the sum total of all things converged into one as defined by the normalized wave function. Although light behaves as a wave or a particle in the physical sense. For us as living souls, “Jesus is the “Light of the World”. How Significant is this Research? Prophetically speaking, we are in the end times. As previously indicated, God created man in his image knowing he would die from sin. To insure man’s return, God redeems his own images and left hidden messages in his creation. As the temple of the Holy Spirit, God wrote his name and his intent in us. In this way, someone would discover that the Gospel of Christ is in the veil. It appear that from the beginning, I am that someone. Therefore, I ask you to help this research spread around the globe through social media. If you are a child of God, you can do no less. For this, I thank you! 1. Collins, Francis S. The Language of God: A scientist presents evidence for belief. No. 111. Simon and Schuster, 2006. 2. Hibino, Suguru, et al. “Identification of an active site on the laminin α5 chain globular domain that binds to CD44 and inhibits malignancy.” Cancer research64.14 (2004): 4810-4816. This entry was posted in biology, religion, science, Theobiology, theology and tagged biology, biomatrixgenesis, blood, convergence, crucifixion, DNA, hyaluronic acid, the veil, Theobiology. Bookmark the permalink. 4 shape-shifting hyaluronic acid (HA) helices (+DNA): Ezekiel’s “wheel in-a wheel”. Fig.1. 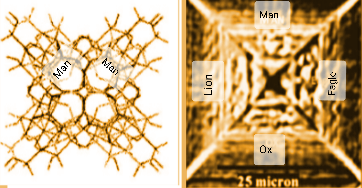 This image shows independent HA molecular modeling results (Haxaire et al) compared with Turner’s nanoscale results found from dehydrating HA fragments. The Spirit of the living creatures (Ezekiel 1:5-20) is in 4 helical forms of HA–each having 4 faces. Hidden messages in hydrated HA fragments (the veil) prove that we are literally created in the Image and likeness of God. For this spirit-filled believer, HA fragments (the veil) can image the gospel message when dehydrated under the heat of the optical microscope. The curtains and the veil described in Exodus were embroidered with cheribim (explained in Ezekiel). This hydro-image shows an embroidery concerning the tabernacle holy places. Notice the schematic of the Holy Place separated from the Most Holy Place by the temple veil. This image on an HA cube correctly depicts the life of Christ. With understanding one should see the Gospel on this HA chip. This figure shows HA embroidery of “the throne room” which is described in Ezekiel and Revelation. Incredibly, the image completely illustrates Jesus Christ’s victory over Satan while now seated at the right hand side of the Father. This HA self-assembly resembles a dividing cell formed from HA fragments during dehydration. The observer effect is captured in the process. One can see a pattern of the Hebrew tabernacle with curtains and the veil. Careful scrutiny supports the cell as a microscale tabernacle. 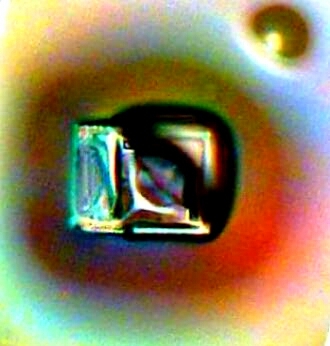 This figure shows the resurrection of Jesus Christ (Yeshua) as told by self-assembling HA fragments during dehydration under the heat of the optical microscope. Interestingly, this image was captured on an Easter weekend under controlled conditions. Notice the serpent at his feet and the lamp in his hand. This figure shows HA embroidery of cherubim as fully described in Ezekiel 1 and 10. The wings contain visual depictions of the gospel message. For instance, the left wing images the Holy Place and the Most Holy Place. The right wing images Satan thrown out of heaven, a flaming sword, and brimstone. 16,000 SUBSCRIBERS (total) plus VISITORS from over 110 countries. 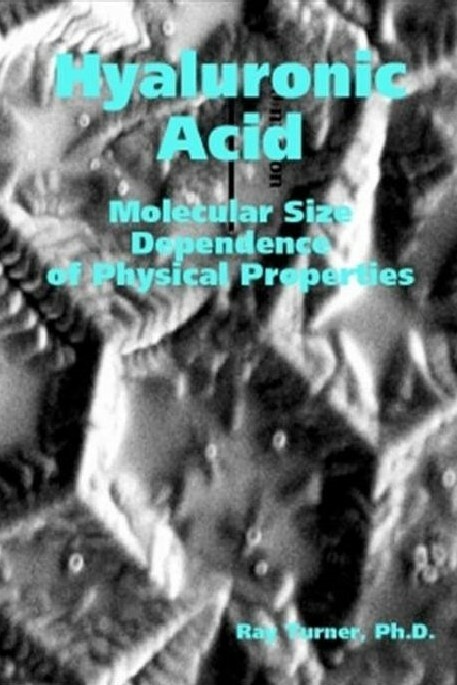 Cover: Actual image formed from self-assembling HA fragments. This book documents the author’s research on the hyaluronic acid (HA) biomolecular veil, a pattern of the Hebrew tabernacle veil. HA is also a pattern of Ezekiel’s wheel. This latter point proves that the Spirit seeks to dwell in us, the living temple of God. While America was in the midths of racial and anti-war turmoil in 1968, African American teenagers vounteered to join the war. I was one of them. This book is this author’s story of over coming the impact of the Vietnam war, racism, and unexpected obstacles to prove to others that they were wrong about him. This book presents the author’s research on hyaluronic acid (HA) molecular size dependence on physical properties. While DNA provides information for biomatrix engineering, its divine metaphysical scaffold is hyaluronic acid (HA).